Like a well-groomed Malinois hound on the scent of a solution to what appears an impenetrable mystery, he follows inspired hunches through twisting country lanes and snaking city streets to their climactic conclusions – though only as often as he vacates his armchair where his “leetle” grey cells work best. His waxed moustaches quiver and his eyes take on a peculiar green intensity as his famously well-oiled grey cells slide into gear. But if his wisdom is legendary, so is his mission to put everything in its rightful place – from cluttered cutlery to wayward souls. At such times, his dapper (if slightly rotund) body becomes a whirlwind of cognitive and corporeal activity. But non, it cannot be! Hadn’t he died in Curtain: Poirot’s Last Case in 1975? Didn’t his creator Agatha Christie pass away the very next year? Oui, mon ami, but surely you’re aware of the trend for resurrecting much-loved literary characters? Sherlock Holmes was raised from the dead not once but twice. First by Arthur Conan Doyle and then by Anthony Horowitz, 81 years after Doyle wrote his last. The master detective’s original resurrection at the hands of his own creator was received eagerly by an avid readership suffering withdrawal symptoms. Horowitz too shifted books by the Hackney carriage-load with Sherlock’s second coming, but could not whip up the same degree of uncritical adoration amongst his fans. Reviews rang with faint praise – “Horowitz lacks Arthur Conan Doyle’s magisterial authority when it comes to chronicling Holmes’s adventures but has added a diverting entry to the canon”. Like the Sherlock reboot, Lisbeth as Lazarus and James Bond unlimited sold very well, yet none of these new avatars of old favourites have ever been fully accepted. And if the howls of protest that greeted the announcement of the P.G. Wodehouse’s Jeeves rejig by Sebastian Faulks in 2013 were anything to go by, then literary resurrections should have been dead in the water. Yet, here is Poirot, alive and kicking! Resurrected by Sophie Hannah, best-selling author of psychological thrillers and life-long Agatha fan. 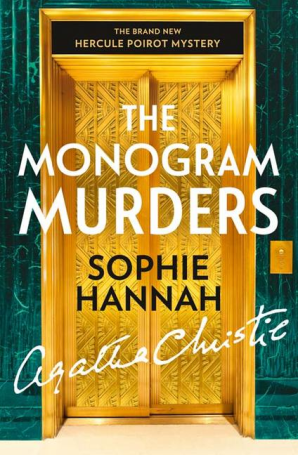 In a situation straight out of Christie’s mysteries, Hannah found herself in the right place at the right time when her agent offered her services to HarperCollins for a Poirot sequel just as the Christie estate (unknown to her agent) decided to enter the continuation novel market. If the Christie family loved the plot structure Hannah presented, they were keen to retain the perspicacious Belgian’s pristine image. Hannah was able to reassure them that she would neither give Poirot “a love life, nor turn him into a gambling Jazz musician”. He would remain exalted, yet familiar, like only Hercule or Miss Marple ever were, with no more back story than Christie provided them. And voilà – the stage was set for the great man’s return in The Monogram Murders. 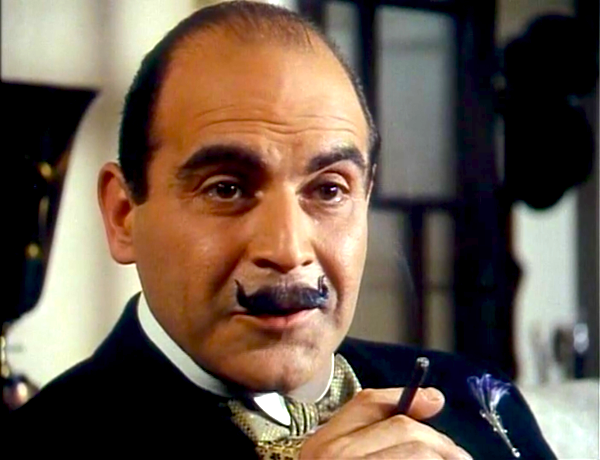 To prepare for this Herculean task (Christie’s fans are as pernickety as Poirot himself, after all), Hannah decided to re-read all 33 novels and watch every episode of David Suchet as the Belgian super sleuth. She also googled the odd historical detail to ensure nothing was amiss in her golden age of mysteries setting of the 1930’s. But having lived and breathed Christie from an early age, her writing style was already heavily influenced by the detecting doyenne’s own and intricate plotting came naturally. Add to that some trademark Poirot flourishes, including his idiosyncrasies and grandstanding finales – and a Christie-esque cosmos wasn’t hard to conjure. “I didn’t consciously try to be like or unlike Agatha. I thought of the most puzzling and gripping mystery that Poirot could solve and proceeded to write that. I wanted it to be Agath-esque, but I didn’t want to mimic Agatha. A writer’s style is like a fingerprint and can’t be duplicated”. And in the new narrator she introduced into Poirot’s world, Inspector Edward Catchpool, she found the perfect reason to deviate from Christie’s style. “I wondered if Hastings should be included in the new books but decided against it. A new character telling the story would be a perfectly sensible reason for it to be told in a new style”. With a clear-cut plan and an avowedly “neat, orderly brain” to implement it, nothing could possibly go wrong with Hannah’s first Poirot novel. When exhuming a body, as any crime writer worth her formaldehyde knows, things can get messy. Bringing Poirot back from the dead did not turn out to be the surgically precise operation that had been envisioned. Millions of books were sold, of course, and Hannah’s choice of plot was every bit as complex as Christie’s. “Nothing is obvious or predictable in this very difficult Sudoku of a novel,” observed Alexander McCall Smith of No.1 Ladies’ Detective Agency fame. There was even a refreshingly modern sense of humour at work. Yet the characters appeared unformed, as online forums lamented. Or “oddly lifeless” as The Guardian pronounced. As if forced to take part in a dress rehearsal just before the curtains rise, the cast of characters hold back from giving their all. Hannah herself hints at this when discussing her depiction of Catchpool as deliberately “useless”, to allow him to develop as a detective in later books. “Catchpool is very neurotic in the first book. Readers have noticed however that he is far more sorted in the second book, which was always the plan. That with each subsequent story, his confidence will grow with Poirot’s help”. That writers grow more comfortable with their characters as they go along is indisputable. When stepping into someone else’s shoes, especially when it is the hard-to-fill, sleek and spotless shoes of Christie, not feeling the pinch at all is near-impossible. Sebastian Faulks said of his attempt to reprise Jeeves and Wooster, “People said it was brave – or stupid. Either way, it was a ridiculous undertaking.” Hannah’s endeavour, with the success it has netted, has been far from ridiculous. Not an undertaker, but rather a reviver, she – she has breathed life back into a grand, old enterprise despite a shaky start. Closed Casket, the second book of the series, is cleverer and more convincing. If the Sunday Times declares it is “no less ingeniously plotted, yet an improvement on its predecessor”, then The Scotsman is moved enough by its “ingenious solution” to proclaim Hannah “Christie’s genuine heir”. What might have been the last nail in this franchise’s coffin, has prised it wide open instead. And with more books to come, there’s life yet in the closed casket. Shreya Sen-Handley writes and illustrates for the British and Indian media, teaches creative writing in England and is Nottingham’s UNESCO City of Literature ambassador. Her memoir Memoirs of My Body (HarperCollins) is set for release in 2017.